Try out the Peak tram! It's not as scary as you think. It's a bit steep but it is slow, plenty of time for you to enjoy the spectacular view. Go to the Viewing Terrace of the Peak Tower to enjoy a full view of the harbour. Needless to say, you would want to go there on a clear day. 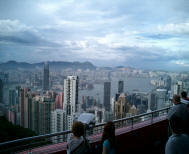 There is a fee of HK$20 to get to the highest level where you can see the best view. Well worth it if you are a tourist, however if you are trying to save a little or perhaps you have a large group you might consider going to the roof of the Peak Galleria which is the shopping center on the opposite side of the peak. The view is similar and free! Go to Level 3 of the Peak Tower where you can go to the street. Opposite to the Peak Cafe there is a map of the Peak which provides guideline for the Peak Trail. The playground at Mount Austin is a mere 10 minutes walk while other walks take 30 minutes to an hour. There are counters everywhere where you can dip your hand into the wax liquid and make wax models of your hand. Somehow you often see parents force their children to do it (dip the hands in the wax) and end up having crying children around the kiosk! The Peak Lookout (used to be the Peak Cafe) is one famous old restaurant on the Peak. Or you can try the various new hip hop ones on the Peak Tower. See Dining on the Peak.